Franklin Resources Inc. (BEN) is a publicly owned asset management holding company. The firm provides its services to individuals, institutions, pension plans, trusts, and partnerships. This dividend champion has paid dividends since 1981 and managed to increase them for 34 years in a row. The most recent dividend increase was in December 2013, when the Board of Directors approved a 20% increase in the quarterly dividend to 12 cents/share. Over the past decade this dividend growth stock has delivered an annualized total return of 15% to its shareholders. Future returns will be dependent on growth in earnings and dividend yields obtained by shareholders. 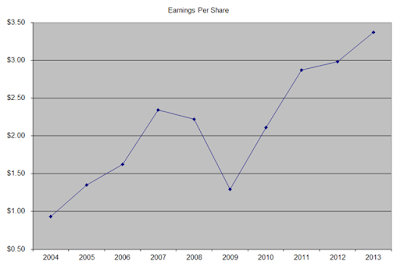 The company has managed to deliver a 17.70% average increase in annual EPS over the past decade. Franklin Resources is expected to earn $3.73 per share in 2014 and $4.07 per share in 2015. In comparison, the company earned $3.37/share in 2013. Between 2004 and 2014, the number of shares outstanding has decreased from 757 million to 628 million. The consistent decrease in shares outstanding adds an extra growth kick to earnings per share over time. It is very easy to buy and sell an investment these days, which makes "asset stickiness" a potential problem. 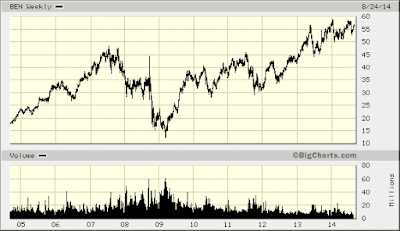 This is why I am actually more bullish on investment advisers such as Ameriprise Financial (NYSE:AMP) than mutual fund companies such as Franklin Resources . However, many individuals who buy an investment such as a mutual fund, tend to hold on to that investment for years. In addition, fewer individuals have company pensions, which means that they would have to manage their own money, or otherwise risk not retiring. This is why professionally managed money will still be around, and earn fees for decades to come. In addition, the products from Franklin Resources are sold through more than 130,000 advisers, which is a way to ensure stickiness of assets. 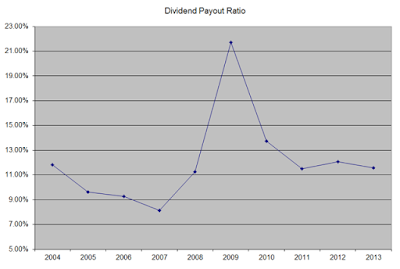 The annual dividend payment has increased by 15% per year over the past decade, which is lower than the growth in EPS. I expect dividends to grow in the low teens over the next decade. While Frankln Resources has a low dividend payout, and a low dividend yield, it has managed to distribute special dividend payments to shareholders on several occasions over the past decade as well. A 15% growth in distributions translates into the dividend payment doubling every four and a half years on average. If we check the dividend history, going as far back as 1988, we could see that Franklin Resources has managed to double dividends almost every five years on average. In the past decade, the dividend payout ratio has largely remained low around 11- 12%. The company has preferred share repurchases to paying dividends, although it has kept raising dividends at a very healthy clip. 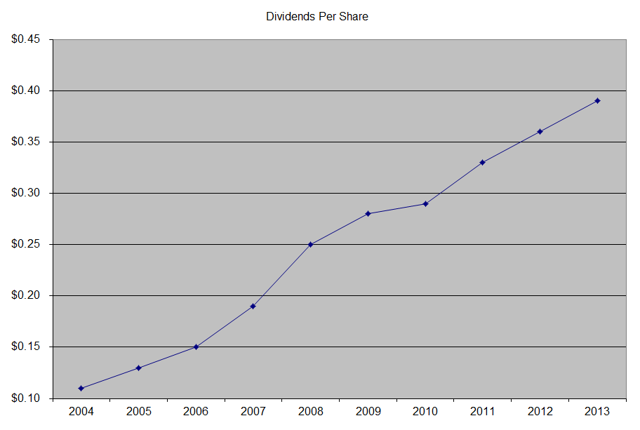 The nice potential for dividend investors is that there is room for plenty of dividend growth in the future. A lower payout is always a plus, since it leaves room for consistent dividend growth minimizing the impact of short-term fluctuations in earnings. The return on equity increased from 15% in 2004 to 22.30% in 2013. While this indicator will closely follow stock market fluctuations over time, I am nevertheless impressed by the high amount. I generally like seeing a high return on equity, which is also relatively stable over time. Currently, Franklin Resources is selling for times 15.20 times forward earnings and yields 0.90%. Many dividend investors overlook the company, because of the low yield. I believe that they are wrong to do so however, because the company offers an attractive valuation today, opportunity for high earnings and dividend growth over time, and the potential for further expansion of the dividend payout ratio. While I do have a minimum yield requirement, I am considering initiating a position in the stock sometime in late 2014 or early 2015, which of course would be subject to availability of cash and other ideas. I would of course start with a small position, but I do believe this company will bring wealth to shareholders in the future. I am hopeful for a stock market decline, which would result in temporary decreases in earnings and share prices. Accumulating the whole position after a five year bull market does not sound very tempting. This is why dollar cost averaging would really help in accumulating a position in asset managers like Franklin Resources.